Claims that Apple's rumored 5.5-inch iPhone will bow months after its purported 4.7-inch sibling were backed up Tuesday with a new report from Taiwan claiming that Apple may be having trouble fitting an ultra-slim battery for the new device. Apple is thought to need a battery less than 2 millimeters tall for its new "phablet," a reduction of about one-third from the current generation. Producing such thin cells is said to be an issue for Apple's manufacturing partners —which reportedly include Samsung and LG Chemical —according to Taiwan's Commercial Times. The publication also reiterated previous claims that Apple is considering calling the still-unannounced device the "iPhone Air," following its recent naming convention for ultra-thin products. 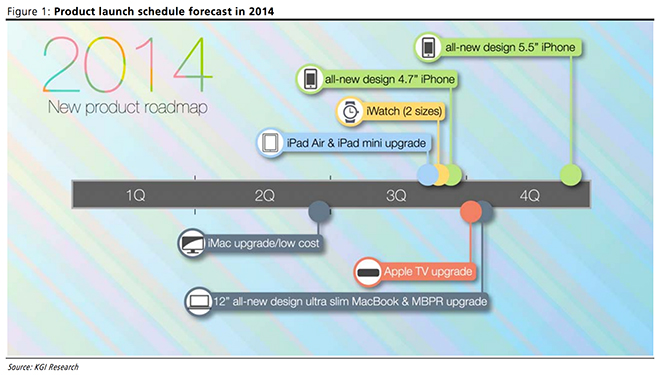 The handset would join the MacBook Air and iPad Air in the category. While Apple has in the past been seen as reluctant to significantly increase the size of the iPhone's display, many now expect the company to release at least two larger-screened models this year. The first, a 4.7-inch device, is believed to be positioned as the "iPhone 6" and will likely launch early this fall. The second, larger device is expected to ship later, and the battery issues may be part of the reason. Well-connected analyst Ming-Chi Kuo of KGI Securities, who has a track record of accurately predicting Apple's product moves, said earlier this month that the company would release the larger handset in the fourth quarter of 2014, possibly months after its smaller sibling.